What I Blog About When I Blog About Books: NOTD: Essie "Da Bush" + OPI "Pirouette My Whistle"
NOTD: Essie "Da Bush" + OPI "Pirouette My Whistle"
Today's notd is a combination that I felt like trying for a while. 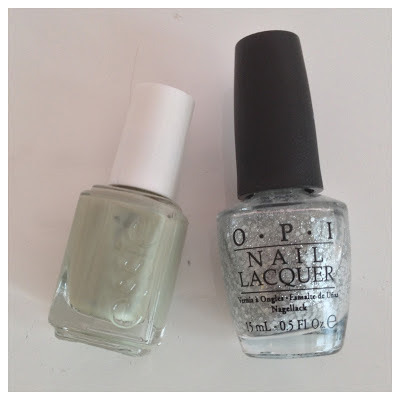 It combines Essie's "Da Bush," a grey-toned military green, and a silver glitter in a clear base, OPI's "Pirouette My Whistle." Essie's "Da Bush," is a grey military green. The formula is fairly streaky. I always think I can get good coverage after 2 coats, but I add an extra due to streakiness. OPI's "Pirouette My Whistle" is one of my favorite, less intense glitters. The clear base makes it easy to layer and the polish itself has the perfect density- not too few, or too many glitters. 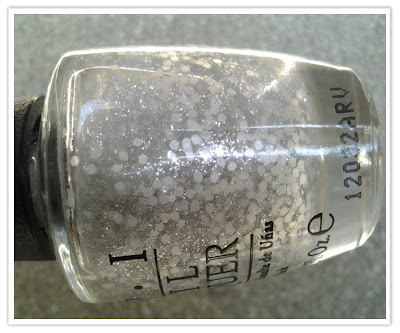 The polish itself has two grades of glitter, smaller ones and larger hexagonal ones. You can see this in the photo below. I like this combo quite a lot. I don't love it, but it's a fun change. "Pirouette My Whistle" works so nicely over neutral/grey-toned polishes. beautiful combination! i love both colors separately and together they make such a chic look!